For some, the weekend was only half-wasted: Saturday was dry, warm, and even partly sunny. However, in South Jersey, it was even rainier and stormier than expected: the wettest spots around Cumberland County received over 4 to 5 inches of rain! As of this writing, the "heavy" rain has exited the state. 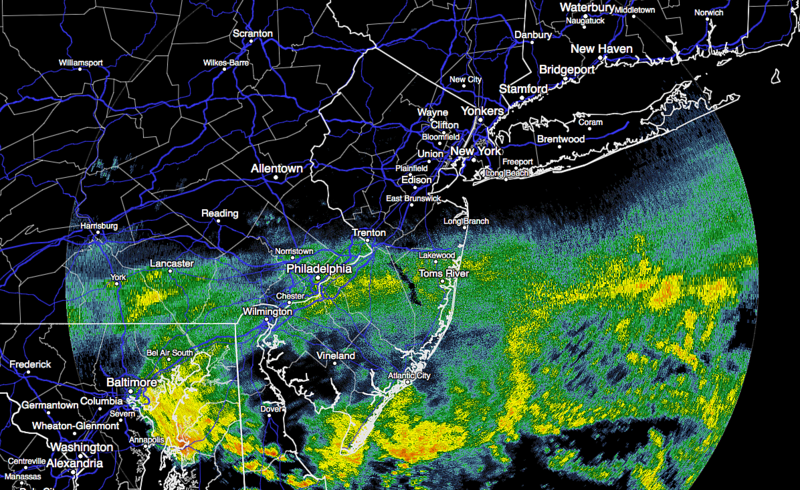 "Steady" rain continues, however, for central and southern New Jersey. That will move off-shore by Monday late morning<?b>, with only "lingering showers" through Monday afternoon. While South Jersey will remain damp and cloudy Monday, skies should predominantly clear for North Jersey as the day goes on. High temperatures will range from the mid 60s along the southern coast, to the lower 70s for the northern third of the state. The combination of clearing skies and falling humidity will lead to some pretty cool temperatures Monday night. Most low temperatures will dip into the lower 50s (mid to upper 50s for urban and coastal areas). If it becomes clear enough and dry enough, 40s are a good possibility for northwestern NJ and the middle of the Pine Barrens. Mother Nature will redeem herself for the unsettled weekend with Tuesday — with a beautiful day! Sunny skies, low humidity, and light winds will combine with high temperatures in the lower to mid 70s on Tuesday. Yes, it's a few degrees below normal for mid-June, but I truly couldn't care less. Pleasant all around. Clouds return to the sky on Wednesday, and we'll see our next storm system and chance of rain. I'm seeing two rounds of potential rain Wednesday: scattered showers in the morning, followed by another batch of scattered thunderstorms in the late afternoon and evening hours. Things to know: 1.) It's not going to rain all day. 2.) Everyone in NJ will probably see rain at some point. 3.) It should be warm and fairly humid in between raindrops, with high temperatures near 80 degrees for most of the state. Thursday will bring a return to dry weather, and thermometers will really start cooking. Under mostly to partly sunny skies, high temps will probably pop into the 80s for the vast majority of New Jersey. The setup for Friday is tricky, with a weak cold front showing up in the guidance. I think it's prudent to include an isolated shower chance in my forecast for now, but it does look like a mostly dry day and event. Temperatures are even trickier, with models all over the map (from 60 to 90). I'm leaning toward a reasonable 80-ish degree forecast, but that's a low confidence call. As it stands now, the forecast for the weekend looks dry and warm and sunny. Fingers crossed that holds true, but such an outlook honestly means nothing this far out.